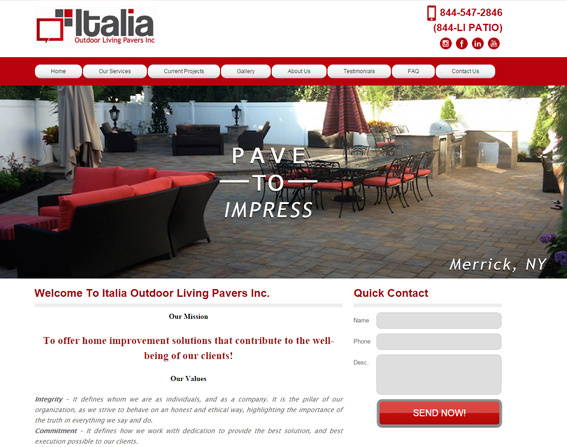 Fabrizio is the owner of Italia Outdoor Living Pavers, primarily operating in Long Island and region. Fabrizio wanted to gain more direct contracts with costumers instead of completing projects as a sub-contractor for other firms that did no work and took a large part of the revenue. So Fabrizio entrusted Go Digital NY with the task of making a website that would give his company credibility, and showcase all of the amazing projects they had completed. Go Digital NY focused on making a website that would optimize conversion rates, making sure that as many visitors as possible became leads for Fabrizio’s company. Now Fabrizio has a high conversion website that he can be proud of and impress his future clients.